Experience the thrill of seeing the "Big Five" by embarking on a safari of the knitted kind from the comfort of your armchair. 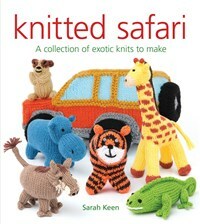 Sarah Keen's latest book, Knitted Safari, is packed full of fabulous safari animals to knit, as well as a jeep to take you on your imaginary adventure of a lifetime. Inside you will find everything you need to know to knit creatures that will entertain children for hours! includes projects to make elephants, lions, a rhino, leopard, buffalo, flamingos, chimps, a zebra, hippos and anteater. Sarah Keen works as a freelance pattern designer and finds calculating rows and stitches challenging, but fascinating. She is experienced in designing knitted toys for children and also enjoys writing patterns for charity. This is Sarah's tenth book for GMC Publications. Sarah lives in Ceredigion, Wales, UK.